VOTED BEST Roof Replacement Services - Beneficial Roofing | VOTED BEST Roofing Company, Call Us Today & See Why! A roof replacement or a roof repair? The answer to this question is important for every homeowner. On the one hand, installation of a new roof is a major investment; and on the other hand, if the roof is in very poor condition and doesn’t provide the necessary protection, the roof repair is an ineffective measure that will just swallow time and money. We here at Beneficial Roofing believe that we can help you decide what’s the best option for you. When determining if a roof replacement is the right choice for you, it is recommended to check, and if necessary, change the gutters and drain pipes. It is also important to check the condition of the roof, the roof structure (beams, planks, boards); roofing sheets, find out whether if there’s a lot of broken tiles and inspect if and where is the water leaking. Once you know the condition of the roof it will be easier to make a decision. Beneficial Roofing is your best choice for a roof inspection! The roof replacement or roof repair depends of course on what your plans are for the future of your structure. If there is a great chance that it would likely be demolished within 10 years, it is obvious that there is no point of replacing a roof because the cost of a new roof is too high. 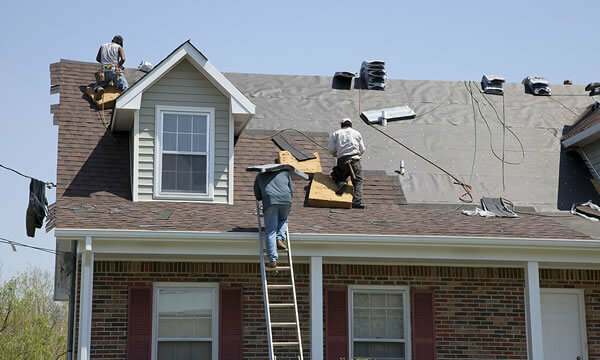 However, if your plan is to have your house for the next twenty years or more, a roof replacement is a perfect option. Therefore, if you have the opportunity, it is best that you get your roof replaced to ensure excellent durability and maintain a tasteful look. The roof replacement will not only visually benefit your house but will also contribute to reduced energy loss. If one day you decide to sell your house, the new roof will certainly become a factor to the increase your property’s value. With years of experience in roofing work and strong focus on customer satisfaction, we provide unrivaled professional service for roof replacement. We fix roofs because that’s what we do best. You can rely on us if you need a roof repair, emergency roofing, metal roofing, residential roofing, or just a roof inspection—whatever roofing needs! A financial responsibility to the client. A top quality of work. We add value to your property. We build with the best materials. We are committed to provide total customer satisfaction. We support you. We offer expert advice. And our advisers are available to achieve your vision.